Click here (PDF 114KB) for a PDF version of this page. For superior cost-effectiveness and flexibility, the MultiFlex family of motion controllers uses widely available (and therefore low-cost) industry-standard SCSI cables and interconnection boards. Many customers prefer the convenience of ordering these directly from PMC. However, some customers may wish to design their own interconnection boards or purchase cables in volume directly from a SCSI cable manufacturer or distributor. For these customers we provide the following information to help them find and specify the right parts. To connect the controller's I/O signals to the outside world, up to four shielded high-density SCSI cables can be connected to a MultiFlex controller (typically one cable for each pair of axes.) For the MultiFlex PCI 1000 Series controllers, the required cables are known as: 68-pin offset 0.8mm VHDCI ("SCSI-5") Male to 68-pin HD68 ("SCSI-3") Male cable assemblies. For the MultiFlex ETH 1000 Series controllers, the cables feature identical HD68 SCSI connectors on both ends. 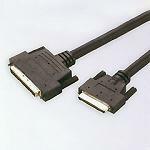 These cable assemblies are readily available from most SCSI cable manufacturers and distributors. The next section includes detailed information for correctly specifying them. These cables are generally available in lengths of 1.5ft, 3ft, 6ft, 10ft (0.5M, 1M, 2M, 3M) and longer. Check with your chosen vendor for the availability of alternative cable lengths. The cable connector that mates to the MultiFlex card is called an "Offset 0.8mm VHDCI Male" connector. It is also commonly called "SCSI-5" or "SCSI-V", "Micro-Centronics" or "Ultra-Micro Centronics", and sometimes called a "VHD68" connector. The cable connector that mates to the Wiring Terminal Board is called an "HD68 Male SCSI" connector. It is also commonly called; "SCSI-II", "SCSI-3" or "micro DB68", and less frequently referred to as; "half-pitch 68", "HP68", "HP68D", "half-pitch DB68", "half-pitch 68 D-type", "68 pin Micro-D (High-Density or Honda)" or "Ultra SCSI-II/SCSI-III". Due to the narrow width of a PCI expansion slot, very close stacking of connectors is required for plugging multiple cables into the MultiFlex PCI series cards. Therefore "offset" VHDCI cable connectors must be used. To the right is an illustration of two closely stacked offset connectors, made possible by the off-center location of these connectors with respect to their backshells. Fortunately, almost all VHDCI SCSI cables sold today feature offset type connectors as a default, since they work with all VHDCI SCSI applications, but we still recommend that you specify offset VHDCI connectors when buying them to ensure that you get the correct ones. There are many manufacturers and distributors of VHDCI-to-HD68 SCSI cables and components. Below is a brief list of some alternative sources for these parts. Cables To Go (C2G) is a leading manufacturer and distributor of computer cables and connectivity solutions. C2G sells Offset VHDCI .8mm to 68M/SCSI-3 Cables in lengths of 1.5, 3, 6, 12, 33, 50 and 75 ft. and offers custom cable solutions as well. C2G part number 20710 is equivalent to our 6 ft. (~2M) standard cable for the MultiFlex PCI Series, part number CBL-VH68-6. Amphenol is a large manufacturer of interconnect products and offers a good selection of SCSI cables and connector components. Molex is the world's second-largest manufacturer of electronic, electrical and fiber optic interconnection products, and also offers a good selection of high-quality SCSI cables and connector components. Tyco Electronics is the world's largest passive component manufacturer and also manufactures a range of high-density SCSI cables and connector components. Customers wishing to design a custom I/O interconnection board will need to specify some type of Female HD68 PCB-mount connector for their design. For help identifying and finding HD68 PCB-mount components available on the market, see PMC Tech Note 1057 (PDF 37KB) or call PMC for more information.